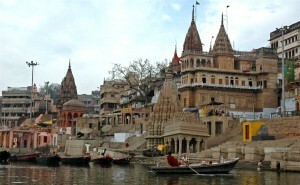 Varanasi has predominated Hindu life in its every facet for at least three millennia. Varanasi derives its name from two streams, the Varuna on the north of the city and the Assi, a small trickle on the south. The most important shrine at Varanasi is the Vishwanath Temple dedicated to Lord Vishveshwara. Maharaja Ranjit Singh gifted gold plating on the temple shikaras. Tulsi Manas Temple and Bharat Mata Temple with the impressive relief map of India carved in marble. Vishwanath Temple, Annapurna Temple, Sankatmochan Temple, is the other attractions. Last and most important, is a visit to the riverfront. The most fascinating aspect of Varanasi is its life here at dawn. The ghats and the temples that line the riverfront are filled with pilgrims paying homage to the Sun God and the Holy Ganga. From here religious excursions can also be undertaken to Sharnath (10 km), Vindhyachal (90 km), Chunar (40 km), Allahabad (128 km), Jaunpur (58 km) and Ayodhya (209 km). Hotel accommodation ranging from super deluxe luxury class to standard and budget class exists in sufficient number to cater to the ever-increasing tourist in flow. Shopping and advanced medical facilities are also available. Air: Indian airlines flies daily between Varanasi and Kathmandu and connects Varanasi to major Indian cities. Rail: Express and superfast trains also connect Varanasi to all parts of India. Road: Varanasi is situated at the junction of three National Highways No. 2, 7 and 29. Buses of UP. State Road Transport Corporation fly between Varanasi and important neighbouring centers. The Nandeswar Kothi: The Nandeswar Kothi built in the late 18th century. Although the exterior finesse has dwindled, the watercolours of the interiors linger on. The Queen’s College: Major Kittoe designed The Queen’s College in 1847-52. It is one of the oldest secular public buildings in the correct Gothic style in India. Built of Chunar stone this college follows a perpendicular style with a lofty central tower and corner towers joined by open arcades. The main entrance has a plaque recording the foundation of the original Sanskrit College. St. Marry’s Church: Situated in the Cantonment area of Varanasi the ST. Marry’s Church has a low tower, spire and projecting portico. Instance of windows the church has louvered doors to the sides and hooded ventilation slots beneath the cornice. This entry was posted in Uttar Pradesh, Varanasi and tagged Holy Place. Bookmark the permalink.